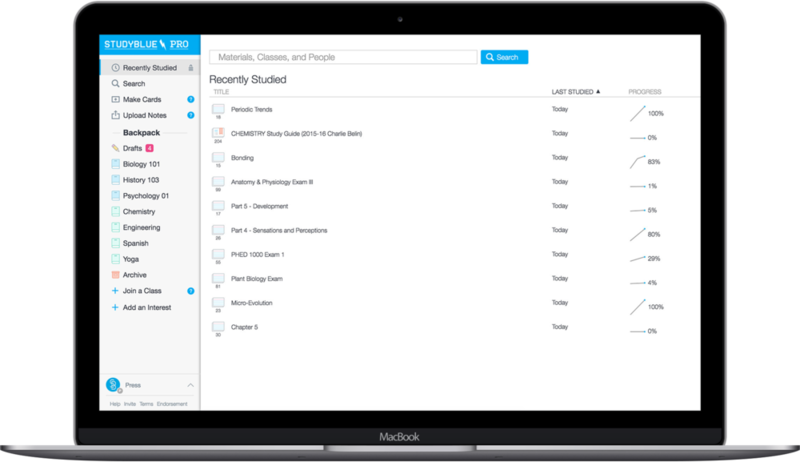 I was tasked with redesigning the in-product navigation bar for the StudyBlue web application. The navigation bar had been previously placed on the left of the application. Previous navigation bar on the left of the web application. We wanted to redesign the navigation bar and bring it to the top of the page to create more space across the body for more content to be shown to users, as well as being able to create a more uniform footer across the bottom of the page. I worked closely with our senior UX designer and our head of product, as well as our front end developer on this project throughout 6 weeks to complete this project, and it is one of the larger redesigns StudyBlue has had in recent history. The navigation bar is still currently a work in progress, and we continue to iterate on it to make sure we're providing our users with the easiest way to access all of the study tools we can provide.